Hoshin Kanri is a Japanese term for what we typically call Policy Deployment or Strategic Planning in English. Hoshin Kanri Planning is a specific way of performing a strategic plan that cascades Long Term Objectives down to Short Term Objectives and then continues to break the strategy into smaller components throughout the organization. If you’re new to the concept here is a quick primer. Hoshin Kanri is a Japanese term for what we typically call Policy Deployment or Strategic Planning in English. Now we start the magic of Hoshin Kanri which is taking this long term view and breaking it down into smaller bite size pieces starting with our Mission Statement. A mission, by definition, is an ambitious goal you accomplish as a team. Once accomplished the team can move on to another mission. Mission Statements should reflect this and be changed once the first mission has been completed. Determining which Key Performance Indicators you will use to measure the success of your business is critical to successful Hoshin Kanri. 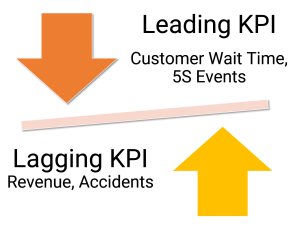 Remember that there are different types of KPIs (or metrics), leading and lagging indicators, measures of performance and measures of activity. 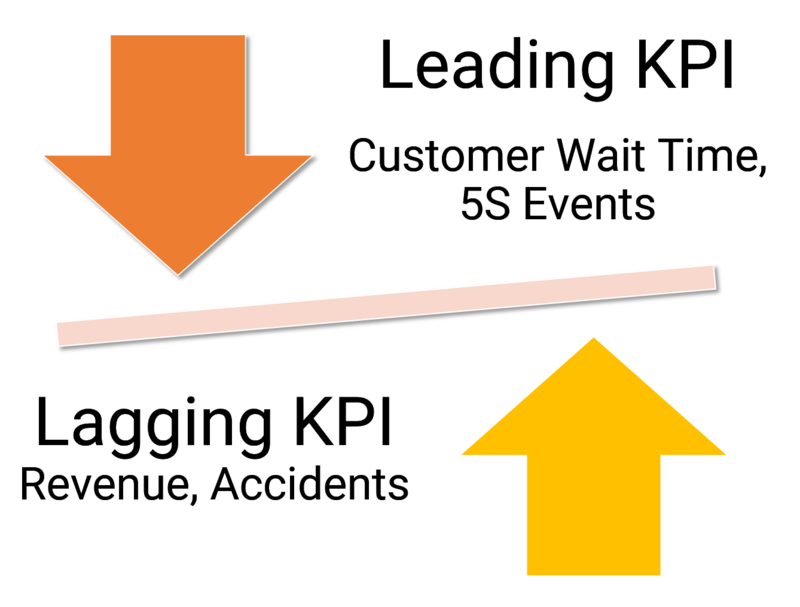 KPIs should be cascaded throughout each department and layer of the organization. Now your Hoshin Plan shows where you’re headed and how you will measure success. The next step is to set a small number of long term objectives. Typically these are things you want to accomplish in the next 3 to 5 years. Then break those objectives down into annual strategic objectives. Be careful. If you have too many the organization will be unable to invest sufficient resources or time to achieve all of your goals and your risk not achieving any of the goals. Use market research and data to make your decisions, not emotion. Look to your team, your data, your value stream maps, and other sources to determine which objectives will have the most impact on your business. Use the success criteria created in step 2, your KPIs, to guide the process. Once you have established your goals (objectives) there should be a direct link from each Goal to a corresponding metric. Is there a match? Goal – Hold at least one 5S event each week to Improve and Sustain the condition of the ED. A goal without a clear, measurable KPI will make it difficult to determine if you have succeeded. Note: Historically companies would use a Hoshin Kanri X Matrix for Step 2 and 3. The X Matrix is basically a spreadsheet that connects your company’s strategic objectives to KPIs and then in a downward spiral to the objectives of each department throughout the organization. You’ll feel like you’re in a downward spiral if you try to use the X Matrix to manage your strategy on a daily basis. KPI Fire replaces the X Matrix with an easy to use, visual tool where projects, metrics, and goals can be tracked together in real time and team members can collaborate to achieve their goals. At KPI Fire we often talk about the Execution Gap in Hoshin Kanri. After a management team establishes a clear vision for what needs to happen and everyone in the organization understands their role in that strategy the real work begins. Daily management processes need to be established to ensure no one loses sight of the Strategic Vision. 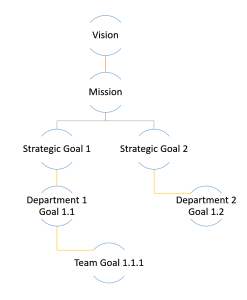 Goals must be broken down into projects and tasks that when completed move the organization closer to acheiving it’s mission. This is where KPI Fire becomes essential. KPI Fire provides an all in one system to track Projects, KPIs, and Strategic Goals in a single place. Management have real time visibility to their team’s goals, KPIs and project performance metrics. KPI Fire enables the daily management systems necessary for proper execution of Hoshin Kanri. Once the plan is in place and every member of the team is working on their portion of the Hoshin Plan management must measure performance, learn, and adjust as needed. If projects are being completed and goals reached but no results are evident in the KPIs it may be that some initial assumptions need to be challenged. If the strategy is sound but there is no accountability to completing projects and reaching goals management completing the Mission can be at risk. Use KPI Fire to hold team members and leaders accountable to their goals and the increase visibility to progress throughout the year. Why choose KPI Fire as your Hoshin Kanri or Strategic Planning partner? At KPI Fire Hoshin Kanri is part of our DNA. We have helped with clients develop and execute their strategy in almost every industry from Healthcare to Manufacturing, from Hotels to Mining. Our flexible Hoshin Kanri training and coaching is customized to fit your unique needs. Whether you need a 1 day Hoshin Kanri overview for your management team or want to engage in a start to finish strategy execution plan, our team will work with you to achieve your goals and get measurable results. Contact Us Hoshin Kanri will help your business! For answers to your questions or to get started with your own Hoshin Plan send us a note at hoshin@kpifire.com or give us a call at 855-957-4347. Our team is ready to help you have the best year yet! Get Started with KPI Fire Already have a Hoshin Plan but your ready to upgrade from spreadsheets to KPI Fire’s powerful online platform? Let’s go!